JANE: So, Alan, last time you were telling me about your problems with living in a gridded city. Are you any more comfortable with it now that you’ve had some months to get used to it? I’ve always found this very impressive. I’ve never been able to identify any direction without staring hard at a compass (and I can only manage that on a good day). But with a structure that follows these rules, it’s easy. Obviously if you are on an Avenue, North is in front of you (or behind you) and, even if you are on a Street, the solution is only slightly less trivial, requiring a mere ninety degree re-orientation of your frame of reference. I was very impressed by the simplicity and cleverness of the scheme. JANE: Ah… Sadly, I must disabuse you of this notion. Although some cities have been planned – D.C. where I was born is a good example – cities in the United States have often grown as randomly as any you encountered when you were growing up in Yorkshire. They haven’t had as much time to become twisted around, but they are not at all organized. Theoretically then, if you know the rules, you could be dropped anywhere in D.C. and calculate your general location. Imagine my surprise that, throughout my life, one of the first things people tell me about their visits to D.C. is how confusing they found it and how easy it was to get lost! ALAN: Despite the fact that you find it surprising, I can assure you that if you dropped me into Washington D. C., I’d be hopelessly lost within seconds. JANE: When I look at a map, I can see why this would happen. D.C. has lots of parks and open areas that interrupt the flow. Smaller cross streets don’t necessarily follow the plan, and, just to polish it off, D.C. has traffic circles. On the whole I’ve found that Americans are not comfortable with traffic circles. If they didn’t grow up with them, they get discombobulated. ALAN: What on earth is a “traffic circle”? JANE: A traffic circle is a hub around which different streets radiate. Dupont Circle in D.C. is a traffic circle about which I’ve heard many complaints because, instead of being able to head directly down an avenue – I think it’s Massachusetts, but it’s been a long time and I don’t have a map – the avenue is interrupted by this circle, which you need to go carefully around before resuming the road you’d been on in the first place. ALAN: Ah! We call those roundabouts. Every major intersection here is controlled either by roundabouts or by traffic lights. I much prefer roundabouts – you don’t have to wait nearly as long and the traffic flows much more smoothly. The rule is that you travel around it in a clockwise direction, giving way to any traffic already on the roundabout and giving way to traffic that will cross your path from the road on your right as you enter the roundabout. It’s all very smooth and simple and safe. Since you drive on the opposite site of the road to us, I presume you go round your traffic circles in an anti-clockwise direction giving way to the left? JANE: Uh… Yeah. I think so. (Imagine me drawing pictures in the air.) Definitely. I think. ALAN: Another major advantage to roundabouts is that going all the way around one sends you back in the direction you approached it from. In other words, you’ve done a perfectly safe and legal U-turn on what is likely to be a very busy road where U-turns are forbidden. This is hugely useful to someone like me – I constantly find myself heading in the wrong direction on busy roads because I got lost again! JANE: A fellow I was friends with in college always said it wasn’t a real trip until you’d made at least one U-turn, so you’re just living your life as a journey. Very mythic. ALAN: There are also weird things called magic roundabouts. They are rather hard to describe without drawing a picture, but I’ll try. The magic derives from the fact that traffic can flow in both directions around it. There is a main island surrounded by one small roundabout on each entry or exit street. You drive in the usual clockwise manner around the mini-roundabouts but, when you leave the mini-roundabouts, you can then drive around the central island either clockwise or anticlockwise depending on exactly which direction you are pointing in when you leave the mini-roundabout. Magic roundabouts are very scary and a lot of drivers are happy go miles out of their way just to avoid them. JANE: Magic roundabouts? See! I told you that you were on a mythic journey! If I ever make it back to New Zealand, someone must take me through one of these. But I’m not driving! Absolutely not! JANE: This, in and of itself would be confusing, wouldn’t it? 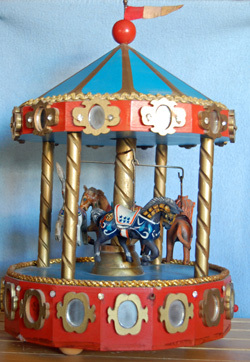 Don’t you Brits call carousels “roundabouts”? Australians seeing those signs might think they’re coming up on an amusement park. ALAN: Yes – roundabouts are indeed the things you call carousels. But I think the Aussies are safe from confusion. There’s all the difference in the world between a roundabout and a Round-A-Bout. Perhaps that explains the odd spelling. JANE: I have some further interesting trivia about D.C. as a planned city, but we’ve rambled on most admirably today. Let’s come back to it next time. This entry was posted on March 26, 2015 at 1:00 am and is filed under Thursday Tangents. You can follow any responses to this entry through the RSS 2.0 feed. You can leave a response, or trackback from your own site. I don’t mind big roundabouts. Small ones, though… There’s one in Santa Monica, CA, that has two single lane roads feeding into it. One happens to be used by commuters, the other one’s local. And there’s a very small roundabout, little more than a concrete island. In any case, that island is quite chewed up by the undersides of large trucks. If they’re big enough and have to make a left turn, the underside of the truck goes onto the island. Occasionally, the truck is too low, and it gets stuck there, jamming the intersection for hours. No one can get by it, and a tow truck can’t get to it, because the roads leading in are so narrow. I think that roundabout was put in to slow traffic down on the commuter street. If so, it certainly worked, sometimes way too well. Now a developer is talking about putting a bunch of these tight little roundabouts in near me. Three in a row even. What fun. Okay… This is amazing! Maybe you should tell those developers about magic roundabouts. The confusion would surely delay them in their plans. Some of the older neighborhoods in Seattle have roads built before automobiles–very narrow–that also include central islands at the intersections, effectively turning them into roundabouts. The streets are more or less a numbered grid, so navigating isn’t hard, but if you aren’t on a major arterial, it takes forever to get anywhere. At last I know why someone can say they’re going North. Thanks for the lesson. Someone told me that a while back and I was totally confused. Don’t get _too_ relaxed. While most North American cities are built on grids – it’s because they were built, they didn’t grow, and when you’re dividing land up and selling it off while the current owners are distracted by other issues, it’s easier to do in rectangular blocks – by no means all of them consistently have avenues run one direction and streets the other. San Francisco only seems to have 3 avenues, and one is E-W, one is N-S, while the 3rd is on a 45deg angle to the others! Chicago, AFAICT, has no avenues at all, so the streets run both ways, and Toronto has both – running both directions – as well as Roads and Boulevards. In fact, Toronto has one thoroughfare named Avenue Road. Seriously. Canadian street naming conventions are a bit different – when you see, for example, 150 Bloor West that tells you that Bloor is an E-W street, and the address you want is about a block and a half west of the (semi-arbitrary) central N-S street (Yonge Street, sticking with Toronto). Actually, that block-numbering convention is primarily used by the Yanks. Among major Canadian cities I think only Calgary – which is also primarily used by Yanks – does it that way. If you found 150 Bloor W a block and a half west of Yonge, it was purely by chance. 288 Bloor W is 5 blocks from Yonge, for example, not 2 1/2, and # 150 is a variable number of blocks west depending on the street [although it turns out that distance on the ground is often similar]. Sometimes it seems roads are designed just to confuse me.